It has never been so easy for you to help the frog and sole of your horse’s hoofs to regenerate! 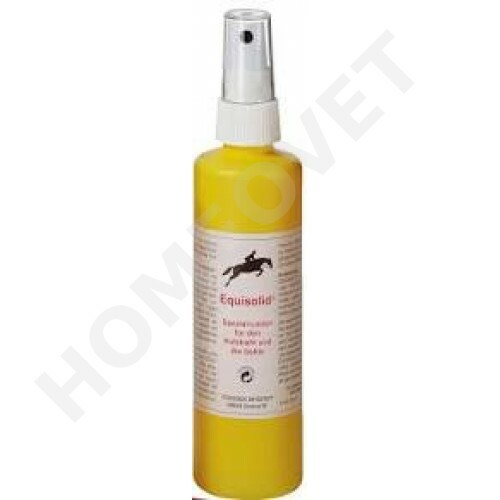 Equisolid special lotion is a very effective agent for the permanent care of frog and sole of the hoof. Equisolid has a horn strengthening effect that develops even in persistent or other problem cases after only several days. You will be surprised about the quick effect! The hoof horn gets hard and clean immediately. Smeary and foul-smelling areas in the horn disappear within a short time. The horn maintains its breathing activity and elasticity. Equisolid does not seal up or fill the pores of the hoof horn as it happens with hoof tar. It creates a natural protection against any bad influences as e.g. moisture or manure. Equisolid is not only suitable for the care of the frog, but also for strengthening the whole sole of the hoof. Even in cases with a porous or brittle white line Equisolid often shows good results. If the shoes did not keep because of poor horn quality, most of the horse can be shod again without any problems. The selected silver formula in combination with absolutely top natural raw materials inactivates bacteria and promotes the normalisation of frog and sole. Problem hooves with therapeutic shoeing as e.g. pad or bar shoes can be protected with Equisolid against any problems or softening beneath the shoes. As Equisolid is liquid, it reaches the deepest spots and can develop its full effect. In case of frog problems apply Equisolid deeply into the grooves of the frog or the clefts. If the horse has therapeutic shoes, application is the same. For care of the sole spray Equisolid on the sole. Hold the hoof up for a moment after application in order to let Equisolid work in into the deep clefts. For an optimum hoof care we also recommend Equidura hoof balm with laurel oil and EquiSTEP hoof oil.